With my boys away at my folks and the girls busy with some summer practice activities, I had the evening to myself once I got off of work. While I was kind of tired, I figured that I’d be a fool to not take advantage of the opportunity to head across the river to my Iowa stomping grounds. Water Conditions – Back on Memorial Day I paid my first visit of 2018 to Lost Grove only to find my regular fishing area to be a real mess of scattered, floating vegetation. As a result, I put in elsewhere which is okay for some exploring but sure wished I could’ve fished my intended spots. I didn’t know what to expect this time around but the vegetation had subsided to a fishable state and water clarity was a stained normal so I was good to go. Company – Usually there’s not much traffic on the section of the lake I frequent, as it takes a little work for the folks in the big boats. However, on this occasion I shared water with four bass boats, one of whom seemed a little frustrated with my presence. We met up near a point, headed in opposite directions. The fellow ceded the rest of the bank, which I didn’t want to fish anyway and I rowed back to fish the same stretch of bank I had just visited for a second lap. About 30 minutes later, the fellow came back for another look only to find me in essentially the same spot and did a donut in the water as he headed out. Not a real bad move, don’t know his intent, but for a guy in an eight foot johnboat it had me rocking for a bit. 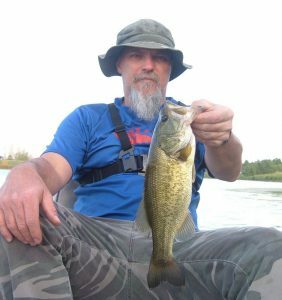 Close Quarters – The pair of bass that fell to the Senko wacky rig both hit with just a few yards of line out and rather tight to the riprap lining the bank. Certainly wished they would have been bigger and sure would have been a handful trying to land a quality fish with 10-pound test on a short line (video of these two catches below). 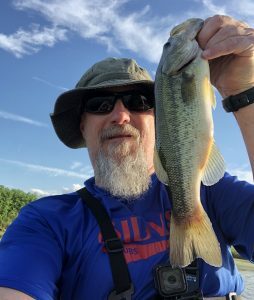 One That Got Away – Lost Grove is good spot for a quick jaunt on evenings such as this occasion but I’ve had some difficulty finding quality bass. I have witnessed a four plus caught and observed a handful of others in that range swimming around but as far as my personal best it stands at 2-3. Had one on this trip that would have given that “PB” a run for its money but wasn’t meant to be as it threw my buzzbait on a leap. Angler error was a major factor in this case as a loose drag meant less than ideal impact on pair of hooksets. Felt the line give both times, knew I was in trouble and sure didn’t take long to confirm. Such is fishing and got some decent GoPro footage to relive my mistake (video below). And below is a slow motion portion of the above clip that is also zoomed in on the bass spitting the lure, pretty cool even though I lost the fish. Overall, a fun evening getaway as the water looked decent, found a few cooperative fish and two of them were “keepers.” After limited summer opportunities and a bit of a 2018 fishing funk it felt good to feel good and have my focus back in being able to truly escape from my responsibilities for a couple hours.